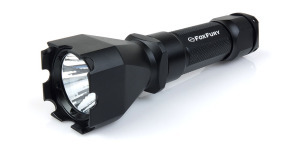 It was a close race, and I mean VERY close, but at the end of the year one flashlight review established itself as the most frequently visited page on the site. That review was on the Streamlight ProTac HL 3. This really shouldn’t come as a surprise considering the HL 3 features Streamlight’s “Ten Tap” programming and a scalding 1100 lumen maximum output. Add the fact that it’s the least expensive flashlight on this list and the HL 3 presents a nice value for a lot of people. This choice may be a little more subjective than the others as I couldn’t wait to get my hands on one of these flashlights as soon as I heard about it. First introduced at the 2013 SHOT Show, the P1R Peacekeeper (check out the full review) was finally released in 2014 and was just about everything I expected it to be. The first SureFire flashlight to be powered by a non-proprietary 18650 battery, the Peacekeeper is a solid performer and is already one of my favorite lights. Ask anyone to describe a handheld flashlight and they will probably tell you about a tube-shaped device that contains batteries. Right off the bat, the SureFire Y300 Ultra (see the review) bucks that trend with its side-by-side battery arrangement modeled after the popular X300 weapon lights. It even includes the same ambidextrous switching mechanism as the weapon lights. While there are other flashlights on the market that have a similar battery layout, the Y300 Ultra gets the nod here due to its unique combination of great output, compact size, and super slick magnetic belt “holster.” It also wins the “Worked out Much Better than I Expected” award as well! My love of the SureFire P60-based flashlights (6P, C2, Z2, etc.) was the impetus for me becoming a full-blown flashaholic. One of the biggest reasons for this was the ease with which these old classics could be modernized and customized using aftermarket parts. It’s difficult to choose just one as the best but I’m going with OVEREADY’s Custom Shaved SureFire 6P (read the review) that was introduced in 2014. Beginning with a brand new 6P, the body is bored to accept 18650 rechargeable batteries and machined to a smooth finish. A custom hard-anodized coating is then applied, creating an ideal foundation for a custom flashlight. With the addition of a Mini TurboHead and Triad Tailcap it approaches flashlight perfection! There are tons of great P60 drop-in modules available today but few can rival the power and precision of the TorchLAB Triple LED module (review). 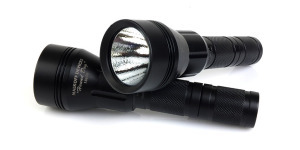 Designed from the ground up for uncompromising performance, the TorchLAB Triple can enable an otherwise stock looking flashlight to produce an outrageous amount of light. The TorchLAB Triple exacts a heavy toll on batteries and must be powered by 18350 or 18650 lithium-ion batteries to realize its full potential. However, for anyone with a host set up to use 18mm batteries, I can’t think of an easier way to achieve mind blowing performance. I love rechargeable batteries as much as anyone but I still go through a LOT of disposable 123A batteries while using, testing, and reviewing flashlights. As a result I’m very glad I ran across the CR123 Blackjack Battery Brick (review) crafted by Fight and Flight Tactical in Calvert City, Kentucky. Designed to hold up to twenty-one CR123 power pills (other variants accommodate AA and AAA batteries), the ballistic nylon Blackjack holds the batteries securely in place and folds up into a neat and compact package. Fight and Flight is a US veteran-owned company that does all design and manufacturing in-house. 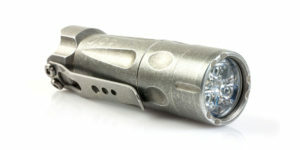 The best characteristics for an Everyday Carry flashlight will vary tremendously from one person to the next but, for me, some of the important considerations are size, versatility, and long battery life. Depending upon an individual’s preferences, nearly any light from this list could be a great EDC flashlight but I’m going with the EDC Rotary 170 from HDS as my 2014 pick (check out the full review). The EDC Rotary is a precision lighting instrument that is compact and surprisingly efficient. Its intuitive rotary tailcap allows the user to select the exact amount of light needed for nearly any task, ranging from a minuscule 0.02 lumens up to 170 lumens of high CRI goodness from the Nichia 219B emitter. I’ve never had to design a flashlight but I’m sure the process involves lots of compromises. However, when Elzetta Design unveiled their Alpha series of flashlights (review) it was obvious they weren’t willing to compromise on two of their hallmarks, modular design and rugged construction. With options including 2 bezel styles, 2 lens types, and 6 tailcaps, up to 24 different configurations are possible with the little Alpha. Producing up to 315 lumens of output, the Alpha is well suited for close-in tasks where a broad diffuse beam is an advantage. Like all Elzetta products, the Alpha is 100% Made in the USA. I really went back and forth trying to choose a single light from this group but finally settled on the new Hound Dog 18650 from Malkoff Devices (review). Using a Cree XP-L emitter, in Cool White or Neutral tints, the Hound Dog 18650 produces up to 900 lumens of output. 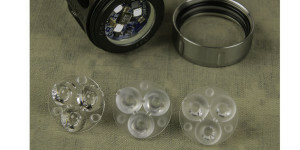 Like the Malkoff Wildcat and previous versions of the Hound Dog, a lower output level may be selected using the Malkoff High/Low bezel switch. With a new head design, the Hound Dog 18650 is smaller than its predecessors and the High/Low bezel switch is still one of the nicest and smoothest methods out there for selecting different output levels. This was a no-brainer for me. After several years in development, the SureFire UDR Dominator (full review) was finally unleashed in 2014. Measuring nearly a foot long and weighing almost 2.5 pounds, this behemoth was also the farthest throwing flashlight I have reviewed, by a very large margin. Even though it is designed to reach out nearly half a mile, the UDR Dominator is no one-trick pony. Its beam provides a surprising amount of spill and the 11 position selector ring allows the user to dial in whatever amount of light is needed. It’s not all about brute force either as there is a lot of technology packed into the Dominator, making it one of the most advanced flashlights around. I’ve got to admit, high-powered flashlights that can reach hundreds of yards are fun. However, a tightly focused high-intensity beam can be detrimental when illuminating objects at more mundane distances. Enter the latest version of the Malkoff Wildcat with its awesome Cree MT-G2 emitter (read more about it in the review). When the full 1600 lumens of output is a tad too much, a lower level can easily be selected via the Malkoff High/Low bezel switch. Twist it back to full output and it is truly a sight to behold! The technology behind rechargeable flashlights has advanced by leaps and bounds since the advent of LEDs and lithium-ion batteries. The SureFire R1 Lawman (full review) continues the evolution with its user programmable operating modes, dual switch configuration, and steady performance. Due to its length and protruding tailcap, the R1 Lawman can be prone to accidental activation. The folks at Multi Holsters recognized this issue and have a great solution in the form of their Kydex R1 Lawman Holster (review). I’ve been blessed with the opportunity to play with some of the nicest stuff around and I’m often asked about my favorite or most used flashlights. To answer these questions I have to go back to a pair of lights I reviewed in 2013. I normally carry at least a couple of flashlights on a daily basis, often rotating through my favorites and/or whatever I’m reviewing at the time. Having said that, I carry the SureFire EB2-T Backup (full review) nearly every day and use it more often than any other. Like with any tool, it’s a matter of choosing what works best for the job. Why the EB2-T? Well, I work in a large manufacturing facility and usually need a flashlight with a fairly tight beam capable of reaching good distance and overcoming the ambient lighting. The EB2-T accomplishes this well and the smooth design is ideal for pocket carry. To make sure the nice smooth EB2 doesn’t slip out of my hand, it is always equipped with the awesome SwitchBack Backup tactical ring from Thyrm (review). The truth is I have lots of favorites and my most preferred flashlight is often a function of what I’m needing at a particular time. Even so, it’s still pretty easy to pick out the one I like the most, the Elzetta Design Bravo with the high-output AVS head (review). Explaining why it’s my top choice takes a little more effort as there are several factors. I love the durable, grooved, and knurled body design. Performance is great with 650 lumens projected into a very useful beam and, perhaps best of all, it’s virtually future proof due to the modular design. If I want a little more output I only need to swap in the slightly longer “Charlie” body for a boost up to 900 lumens. When a more diffuse beam is needed, it’s a simple matter to change optics for a different beam pattern. The Bravo, combined with the other Elzetta components, allows me to configure (or reconfigure) the flashlight any way I want it. 2014 has been a great year thanks to all of you, the readers, and the manufacturers of the great flashlights and accessories we all enjoy. I would also like to give a very special “thank you” to Battery Station for sponsoring the runtime testing by providing CR123A batteries. I’ve burned through a lot of these batteries in 2014 and the many runtime tests simply would not have been possible without their support. Now it’s time to get ready for 2015. I’m looking forward to it and wish everyone the best! Be sure to sign up for the FlashightGuide newsletter so you don’t miss out on any future articles and reviews! Posted in Elzetta Reviews, Flashlight Accessories, Flashlight Reviews, HDS, Malkoff Reviews, OVEREADY, Streamlight Reviews, SureFire Reviews and tagged Elzetta, HDS, Malkoff, Moddoolar, OVEREADY, Surefire, TorchLAB. 2014 was a great year. Thank you for all the hard work Jim. Your photography and writing skills make learning about new flashlights fun. I’m looking forward to 2015. Hi Gil, thank you for the kind words. They mean a lot to me. I never thought my name would be in the same sentence as writing, photography, and skill! I’ve gained some practice over the past year and a half but I still have a lot to learn! Awesome stuff as usual. Fantastic end of the year writeup. Jim, Didn’t you miss Fenix here? I was expecting at least one from the Fenix brand because of their recent popularity (especially Fenix pd35). Hi Alex, thanks for visiting. I only included flashlights that I actually owned and had used during the year. 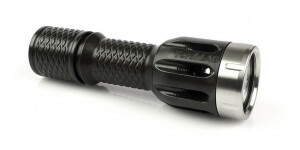 Fenix does seem to make some nice flashlights, I just didn’t have first-hand experience with any of them.